This past season, while hunting with Mike Pavlick at Golden Triangle Outfitters, I warmed to a stand on a wooded hillside above Conservation Reserve Program (CRP) lands and food plots. The deer traveled up a finger ridge past my stand to bed, and they always came to a specific location on the ridge to make their move. While doing some midday scouting, I learned the reason for their specific travel location — a fence ran along the midsection length of the ridge and an open gate invited the deer through the fence and to their bedding cover. Pavlick used the open gate to funnel the deer past my tree stand before the deer entered their daytime bedding hideout. Recently I was muzzleloader hunting in South Dakota with outfitter Cody Warne, who specializes in pheasant hunts but has a weakness for giant whitetails. Warne’s property is a treasure chest of food plots, wetlands and native cover. He interconnects them by mowing paths that serve as hunting strips for the pheasant hunters, but also as trails for the whitetails. On the second day of my muzzleloader hunt, a perfect 6x6 buck followed a mowed trail to within 60 yards of my stand and veered off of it to investigate the path of several does just seconds before stepping into a shooting lane. Too bad for him that his course steered directly behind my tree. I tagged him after a shot from 30 yards. 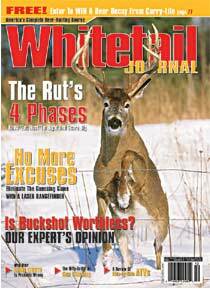 To be effective, the plot should contain “candy feed” such as corn that whitetails can’t refuse, but it should also include foods that provide energy and protein for herd health. Rich Sundberg and Mark Watkins operate, a do-it-yourself property. 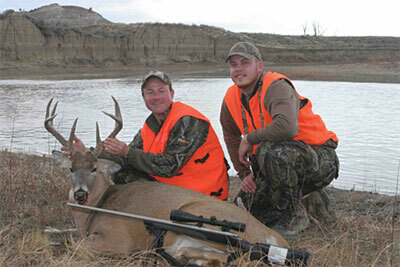 Those guys provide the stand sites, but it’s a self-guided hunt. To benefit the hunters, they have riddled the river-bottom property with mini food plots that encircle a large alfalfa field. As the deer emerge from bedding cover, they help themselves to a quick morsel from the mini plots before converging at the night club for a major meal of alfalfa. Last season while scouting the property for a future hunt, I watched a turnip patch as it drew dozens of deer from thick bedding cover into openings perfect for close-range firearm or archery shots.